on the Matlab command prompt to open the list of demos, or access the page from the Matlab Help/TOAST Toolbox/TOAST Demos link. More info about the demos is available here. Below is a list of online tutorials shows typical use examples for the Matlab-Toast toolbox. Each tutorial contains a link to the Matlab script to recreate the example. Create a spherical mesh with the Gmsh user interface, and import it into Toast. Create a sphere with multiple regions by adding internal surfaces. 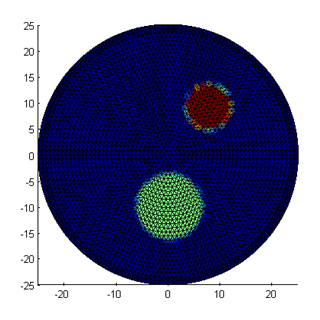 This example shows how to define inhomogeneous parameter distributions by mapping bitmap images into the mesh basis, and evaluates the data differences to the homogeneous solution. This example applies modifications to the script to allow for the calculation of complex-valued measurement data from modulated light sources. This example shows how to solve the time-dependent diffusion equation by applying a finite-difference scheme to represent the time derivative. It shows the setup of the system matrices and the solver loop for the time steps. Simultaneous reconstruction of the absorption and scattering parameters requires sufficient information in the measurement data to distinguish between the effects of the parameters. This example shows that steady-state intensity data do not allow to reconstruct for both parameter distributions. The Jacobian defines the derivative of the forward operator with respect to given parameter distributions. It is an important element of many reconstruction algorithms. 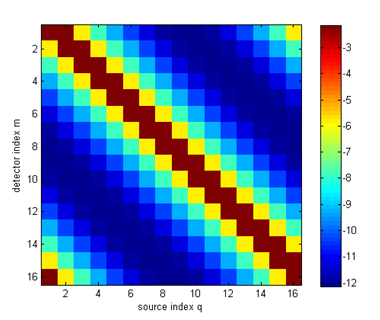 This example shows how to calculate the Jacobian, and the interpretation of individual rows as photon measurement density functions.